Accept was one of the top heavy metal bands of the 1980's. I became a fan when "Restless & Wild" came out. Their sheer speed and aggression along with Udo's Dirkschneider's high pitched shriek made me an instant fan. Songs like "Fast as a Shark" had a distinct effect on the evolution of thrash and speed metal. The first three Accept discs are a mixed affair. "Restless & Wild" was the first disc I got into, so the first three never quite matched up. Up until CMC released this cool double disc, these discs were relatively hard to find on cd. Actually the second disc "Breaker" is a decent heavy metal disc that stands up to "Restless & Wild" and "Balls to the Walls" (well almost) Songs like "Starlight," "Breakers" and "S.O.B" stand the test of time well. I'm A Rebel, however, sounds a bit more dated and nowhere near as good as the aforementioned discs. "Save Us" actually sounds like a disco tune with it's funky bass lines. GAK! Cool double disc, however. The insert is a single page with no photos, no lyrics and very little credit info. At least the cover art is the original art. Paid $13.98 for a used copy. Probably didn't cost that much new in 1994 when this double disc was released. Oh well, that'll teach me to wait to long. Now out of print! I bought this German import assuming, by the cover of the lady with the chainsaw, that this was the first Accept disc. While it has some of the songs off that album, what it actually is is a "Best of" their first three discs. Oh well, guess I will have to hold on to the crappy vinyl copy for a while longer. A genuine heavy metal classic. No metal fan should be without this disc. It contains one of the very first speed metal/thrash songs "Fast As a Shark." (A song covered by Forte, Rage and Steel Prophet) "Princess of the Dawn" is a concert favorite and was played live right up to the time Accept folded some ten years later. Actually there is not a bad song on this disc. This was the first Accept disc that I went looking for when replacing my old records. This was the album that broke Accept lose in America. The title track became their calling card. To this day when you mention Accept you'll get the reply, "Didn't they record "Balls to the Wall?" Not much to say on this album except that it is one of the all time classics of heavy metal. Udo strut his stuff all over this one. My wife still cringes every time she hears those balls being squeezed in the title track. Worth the $9.99 I paid to replace my crappy vinyl. Hammerfall does a killer version of 'Head Over Heels' with Udo sharing lead vocals. When this one came out I thought that Accept had sold out. It was so much more commercial than their past two albums. I didnít buy it for the longest time. Listening to it now, although it is not as aggressive as "Ball to the Wall" or especially "Restless & Wild" it's still a very good heavy metal disc. Picked this one up new relatively cheap ($7.99). Not a bad Accept album, but no where near as memorable as any of the last four albums. I only recently obtained a copy to complete the collection. UDO left soon after "Russian Roullette" due to creative differences with guitarist Wolf Hoffman and formed U.D.O.. Wolf wanted to continue exploring the commercial metal formula of the previous year's "Metal Heart," while vocalist Udo Dirkschneider wanted a return to the heavy metal approach of their uncompromising breakthrough "Balls to the Wall." This disagreement over style may have been why "Russian Roullette" was such an unfocused album. Bought my copy through Dream Disc for a mere $6. No Udo Dirkschneider, No ACCEPT! This is a weak commercial piece of crap that sounds nothing like the German power metal that Accept are pioneers of. Now if this album had come out under another name, this album probably would have done better, but as I said, no UDO, no ACCEPT! This album was suppose to be the end of Accept as they had supposedly called it a day. It didn't happen, but this live offering shows Accept in their prime on the "Metal Heart" tour. Every song is well executed and the production is excellent. Good way to introduce someone to the bands large catalogue. Accept in the 90's have not really changed much. Accept know what they do best and that is play METAL! Some decent songs on this reunion disc with UDO back at the healm. Favorites songs are "Slaves to Metal" and "Objection Overruled." Another fine true metal album with 'ol Udo and Co.! Unfortunately, it would be their last. Loads of cool riffs that the Scorpions should check into, as Accept have stayed much more interesting than their fellow German metallers. 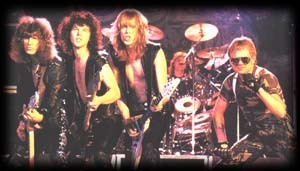 "The Final Chapter" was recorded during the band's final tour. It was designed as Accept's farwell album, which is a respectable way to depart. All songs are well executed and have that live energy that makes live discs so important. A great way to go out and an excellent testament to one of the heaviest German bands of the 1980s.